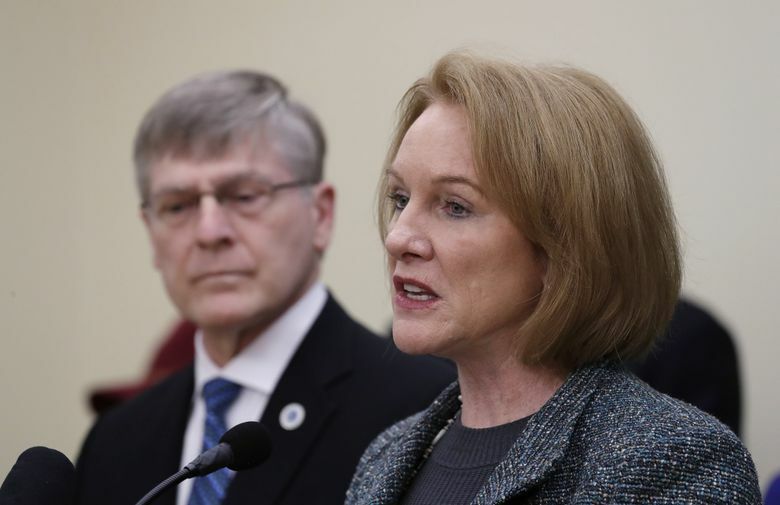 Mayor Jenny Durkan and City Attorney Pete Holmes are declaring the news a victory for Seattle and its policies, including a law that in most cases prohibits police officers and other city employees from asking about a person's immigration status. The Trump administration, after threatening to withhold funds for Seattle in retaliation for the city’s immigration policies, has agreed to hand over the money, according to Mayor Jenny Durkan and City Attorney Pete Holmes. Seattle and nearby jurisdictions have been approved for $657,975 in Justice Assistance Grant funds, the U.S. Department of Justice said in an Oct. 10 letter to the city. Durkan and Holmes are declaring the news a victory for Seattle and its policies, including a 2003 law that in most cases prohibits police officers and other city employees from asking about a person’s immigration status. Police officers can ask when required by court order and when they have reasonable suspicion to believe a person has been previously deported and has committed a felony. Since 2017, U.S. Attorney General Jeff Sessions has been warning about a crackdown on Seattle, King County and other local governments across the country that the Trump administration considers so-called “sanctuary jurisdictions” because they have policies limiting their own participation in immigration enforcement. “Donald Trump and Jeff Sessions blinked, Seattle won and public safety prevailed,” Durkan said in a statement over the weekend. The Trump administration has argued cities and counties with sanctuary policies are protecting illegal immigrants. Local leaders have said they have no obligation to carry out immigration enforcement, which is the federal government’s job, and aren’t doing anything wrong. They also have said police should mostly avoid involvement in order to build trust from immigrant communities. President Trump slammed sanctuary cities during his 2016 campaign and issued an executive order shortly after taking office that such jurisdictions would be cut off from federal grants. Seattle sued the Trump administration over the executive order, and a Seattle judge declined to dismiss the lawsuit. But Sessions issued additional warnings about the Justice Assistance Grant funds, attracting defiant statements from local leaders each time. Federal court rulings in August sided with jurisdictions like Seattle, bolstering the city’s position, according to Durkan’s office. Seattle will split the fiscal 2017 funds with King County and other jurisdictions in the region. The city’s allocation will be $252,157, and the Seattle Police Department will use the money to pay three crime-prevention coordinators, according to Durkan’s office. The coordinators organize block-watch programs and attend community public-safety meetings. Conditions enclosed with the Trump administration’s Oct. 10 letter to Seattle say local governments, in order to keep the money, must not restrict the exchange of information about a person’s immigration status. But Holmes said the city appears to have prevailed. “As we have said all along, there was never any legal basis to withhold this money,” he said in a statement.